Why should the government own the RBI? The Reserve Bank of India (RBI) decided to transfer an interim dividend of Rs 28,000 crore to the government in the current financial year (2018-19 or FY19) at its board meeting on Monday. “Based on a limited audit review and after applying the extant economic capital framework, the board decided to transfer an interim surplus of Rs 28,000 crore to the central government for the half-year ended December 31, 2018,” the RBI said. The RBI board also “reviewed the current economic situation, global and domestic challenges, and other specific areas of operations”. The dividend transfer will help the Centre meet its revised fiscal deficit target of 3.4 per cent of GDP for FY19. The government has accounted for the dividend in the interim Budget for 2019-20 (FY20). The interim Budget has revised the dividend from the RBI, nationalised banks, and financial institutions from Rs 54,817 crore to Rs 74,140 crore for FY19. This is the second successive year that the RBI will transfer an interim surplus to the Centre. Usually, the central bank, which follows a July-June calendar, transfers dividend after closing its accounts in August. In a first, the RBI conducted a statutory audit of its half-yearly accounts to arrive at the interim dividend sum. In August last year, the government had received Rs 40,000 crore as dividend from the central bank after it closed its accounts for the July 2017-June 2018 period. With the transfer of interim dividend, the Centre will receive Rs 68,000 crore in the form of surplus from the RBI for FY19. The RBI had, for the first time, transferred an interim dividend of Rs 10,000 crore in 2017-18 or FY18 on the latter’s request. In FY18, the dividend received by the government from the RBI stood at Rs 50,000 crore. In 2016-17, the Centre had received Rs 65,876 crore as dividend from the RBI. For FY20, the government is seeking Rs 69,000 crore as dividend from the central bank, about 83 per cent of the combined dividends of Rs 82,911 crore that the Centre has budgeted from the RBI, state-owned banks and financial institutions. While transferring the dividend, the central bank keeps a share of surplus towards various risks and reserves every year, as per its economic capital framework. An expert committee, led by former RBI Governor Bimal Jalan, is examining the issue of revising this framework and determining how much surplus should be retained by the central bank. Before this meeting, Finance Minister Arun Jaitley addressed the customary post-Budget meeting of the RBI’s central board. All the secretaries in the finance ministry were also present in the meeting and discussed with the RBI board the Budget announcements. 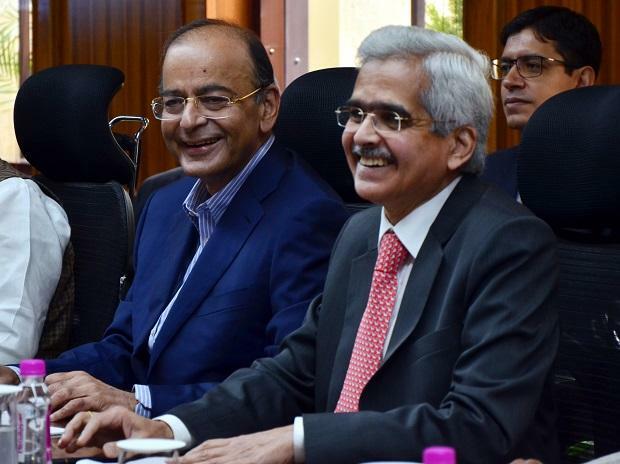 At a press conference after this meeting, RBI Governor Shaktikanta Das said he will meet the chief executives of state-owned banks as well as private sector banks on February 21 to discuss the issue of passing on the benefits of the repo rate cut to customers. “Transmission of rates is very important especially after central bank announces a rate cut. It’s already stated in our post monetary policy committee conference,” Das said. The RBI had earlier this month cut the benchmark interest rate, repo rate, by 0.25 per cent to 6.25 per cent, in what was Das’ first monetary policy meeting. At the press conference, Jaitley reiterated that the government will continue exploring mergers and acquisitions of state-owned banks. “Our experiences in the past really have been of the State Bank of India merger, now there is a second one which is taking place. India needs fewer and mega banks which are strong because in every sense from borrowing rates to optimum utilisation, the economies of scale as far as banking sector is concerned are of great help,” Jaitley said. Three banks — Bank of Baroda, Vijaya Bank and Dena Bank — will become a single bank from April 1, in a first merger of three public sector banks (PSBs) announced by the government last year. Earlier, SBI’s five associates and Bharatiya Mahila Bank were merged with SBI in 2017.